Nashville, Tenn. (September 3, 2014) — The full schedule of artists and performances for Wide Open Bluegrass StreetFest, the free street festival portion of Wide Open Bluegrass, has just been announced. The roster of artists performing at Wide Open Bluegrass StreetFest, held October 3 and 4 in Raleigh, North Carolina, includes a broad mix of local, national and international bluegrass talent. The full schedule of artists and performance times for various stages at the free Wide Open Bluegrass StreetFest is listed below. For any schedule adjustments or additions, check www.wideopenbluegrass.com. The PNC-presented free Wide Open Bluegrass StreetFest, held in downtown Raleigh along Fayetteville Street, will feature more than 80 bands, four music stages, a dance tent, vendors, concessions and a special youth stage near the Convention Center that will feature performances and activities from the future stars of bluegrass - including programming set up by IBMA’s Youth Council. 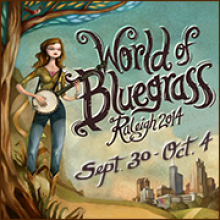 Additionally, StreetFest will contain a Bluegrass Expo Hall and a Masters Workshop Stage in the Raleigh Convention Center.